Lieut. Ellison graduated from Western in 1938, and attended school at two Uni­versities before going into the service. At Western, Jack Ellison was well liked during his four years at the school. He was tall and handsome, and always he was interested in a military career. He was one of the first Al­ton men to go on active duty in the war. He was called to active duty with the Alton National Guard in 1941 and was made a second lieutenant in 1942 after special infantry training. Desiring more ac­tion, he asked to be changed from the Infantry to the Para­troopers. He was an excellent and efficient officer. Lieut. 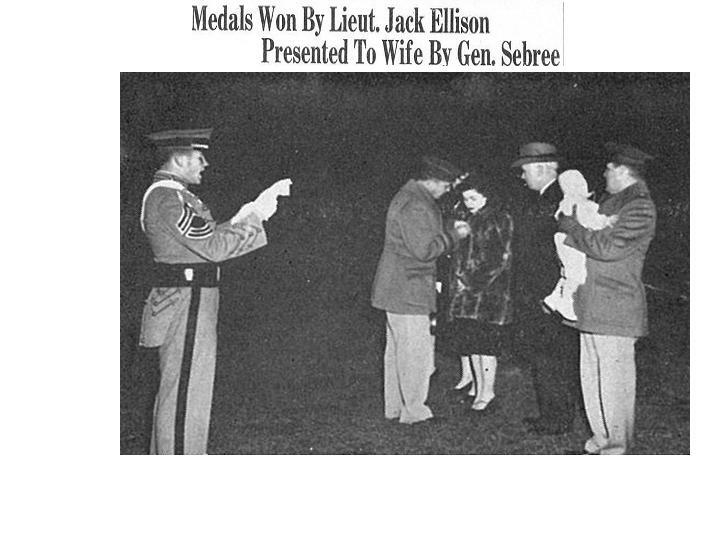 Ellison was killed in action in Luzon in 1945 while directing the rescue of American troops trapped in a burning building under heavy Japanese fire. He was posthu­mously awarded the Bronze Star and Silver Star medals. Lieut. Ellison left behind his wife, Miriam Kindermann Ellison, a former Monitcel­lo girl, and his son, Robert Jackson Ellison, 7 months old, whom he never had the chance to see. His son Rob (the baby in the photo) was killed in South Vietnam while flying into Khe Sanh with a large group of Marines. Rob Ellison and the Marines on that fatal flight are buried in a mass grave in a military cemetery at Jefferson Barracks in Missouri.